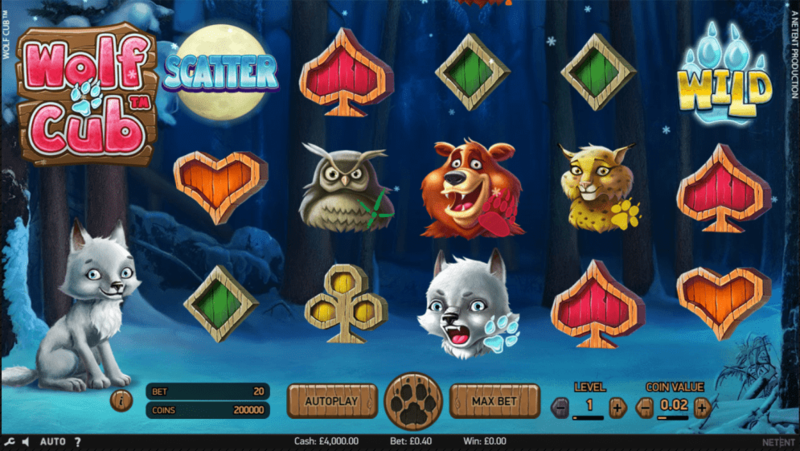 Wolf Cub by NetEnt is a 5 reels and 20 payline slot with a snow setting featuring a snow-capped forest and 5 animals including an owl, lion, bear and more. Of course wolf cubs are the main characters of the slot. The Free Spins feature is sure to make you fall in love with this slot since you can win up to 115 of them. Stakes start from 20p to £200 per spin on all your devices- desktop and smartphone. Find more by clicking here now. NetEnt was founded in Sweden in 1996 and is considered one of the most successful internet casino software providers. NetEnt was the first company to develop Java based online casino software, although they use HTML5 now. More than 300 fully licensed portals use NetEnt casino software is in in. They also own NetEnt Live Casino, a live dealer casino platform and NetEnt Touch, a mobile gambling platform. They also own a progressive jackpot network, which has paid out tens of millions worth of prizes since it began. Wolf Cub looks great- set in a snow-capped forest in the eerie hours of the night with great quality graphics and animations. The detail is well done. Symbols include; the lower value stack of cards, 5 animal symbols –bears, snow leopards, owls, moose and wolf cubs. The wolf cubs pay the highest among the normal symbols with 5 giving you up to 600 coins. Find new slots with similar symbols. 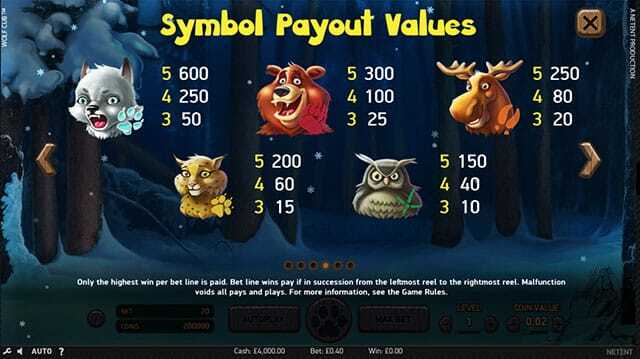 •Wild symbol- The wild pays out the highest value where 5 give 2,000 coins, i.e. 100x your bet and also substitutes for all the other symbols except the scatter. •Scatter symbol- The moon silhouette is the scatter. If 3 or more scatters land anywhere on the reel, they trigger the Free Spins feature. All reels with a scatter icon spin and numbers replace the icons on those particular reels. The numbers are then added together to give a certain number of free spins that can get as many as you’d like, but they won’t pass the 115 free spins total mark. •Blizzard feature- This feature is activated during Free Spins. It occurs when an icon lands fully stacked on reel 1. Anywhere that symbol has occurred also spreads onto reel 1 so that you have more of that same symbol. For example, if you land 3 wilds on reel 1 and a wild on the top and bottom rows of reel 5, it spreads and gives you wilds on the top and bottom rows of all the other reels. Higher value stacked symbols lead to higher wins. Wolf Cub’s variance sits in the middle with bigger wins coming in through the Blizzard feature during Free Spins. The game looks visually appealing and has a good dose of fun. It’s a good addition by NetEnt but try out Wish Upon a Jackpot if you enjoy it.